I love little boxes. And that means there are always some around, so I have to think of things to do with them. I needed something to put the little Valentine necklace in because I think presentation of a gift is almost as important as the gift. I had thought of making a bag, but I’m still in the middle of reorganizing my craft room (let’s just leave it there) and so it was easier not to try to get my sewing machine out. I simply painted it with an acrylic paint called Metallic Bright Red, but it looked for all the world like red fingernail polish to me. Perfect! It took a couple of coats to cover the box, which was black. 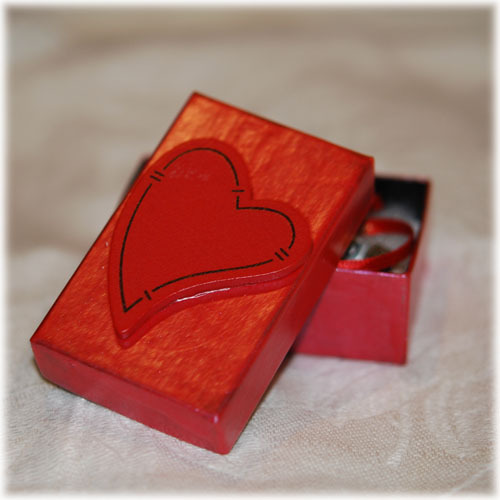 Then I glued on a wooden heart which I got at a craft store ages ago –one of those things I saw and thought, “This would be cute on something.” I have a metal tin with various hearts, buttons and wooden, just for this sort of thing. Don’t you? I just glued it with regular white glue. I waited until the next morning so everything would be nice and dry, put the necklace in with the filling that was already in there (I always save that too, but you could use tissue paper or batting or whatever) and then tied it up with a thin little ribbon and voilà! Now it’s sort of a dual gift, since I think the little box could be used to keep something in too. 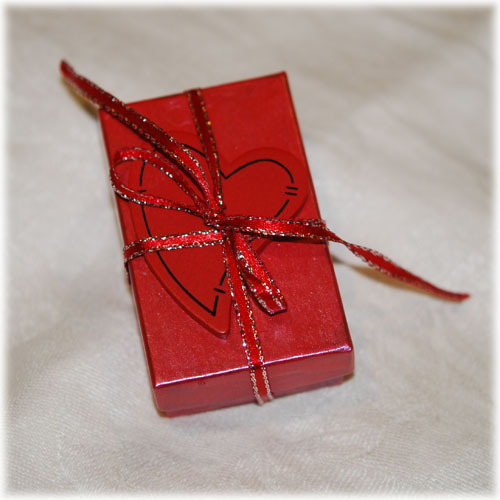 Oh, and if you don’t have a little stash of hearts to glue on top, just cut one out of cardboard, I think that would look just as cute –paint it a slightly different red so it will stand out. 🙂 OK. Now, go make something pretty, Valentine’s Day is almost upon us!